This free program will be limited to 50 guests per tour and available on a first-come, first-serve basis at 1pm and 2pm on August 17. Guests must sign up at the Information and Reservation Counter in order to participate. Happy Hour at Sharks Underwater Grill and Flamecraft Bar will also be extended until 11pm on August 17 for “Thrill Fest Ride Night”. Plus, valid August 13th through 19th including “Thrill Fest Ride Night”, guests can purchase four ride photos for $25, redeemable at Adventure Photo in the park. If you’re 21+, don’t forget the free brews will be available all summer long through Sept. 2, 2018 from 10:30am to one hour before park close. Complimentary domestic and seasonal beers will be available to guests 21 years of age and older. Guests can visit Mama’s Pretzel Kitchen Patio and receive up to two complimentary 7-ounce beers per visit. Thrill Fest Ride Night is included with your SeaWorld admission, including the “2 for $99.99” advance purchase ticket: Choose your thrill – enjoy a full day of coaster fun at SeaWorld Orlando, then choose a second park to visit for FREE: go extreme and double your coaster miles at Busch Gardens or dive in and brave the steepest multi-drop tower in Orlando at Aquatica. 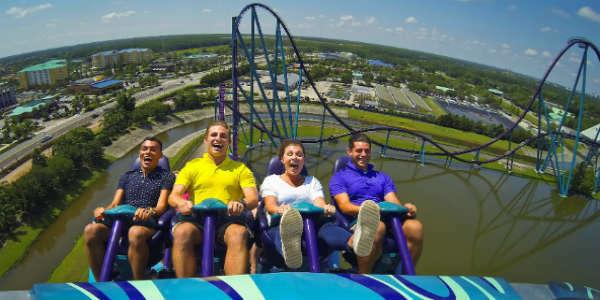 For more information, and to purchase tickets and passes, visit SeaWorldOrlando.com.